We can't fix a problem unless we know about it! Please be in touch . . . The Labyrinth Community Network (LCN) is a group of volunteers who value the experience of walking or tracing a labyrinth. You will find a directory at this site of the countless public and private labyrinths located throughout Ontario. Our helpful line of Hemp based lotions and balms originates in Trail BC, the home of The Hempest. 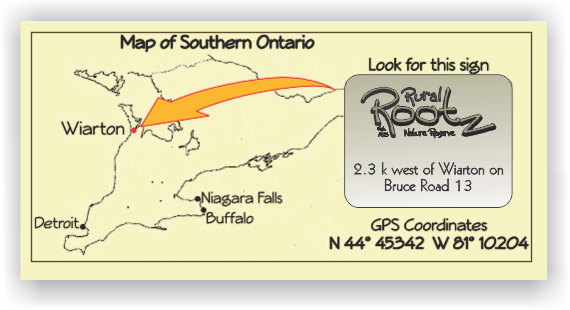 Our Rural Rocks Side Trail was chosen by the Bruce Trail Association as one of 40 hikes to celebrate their 40th Anniversary. Dianne Adams is a Holistic Health & Wellness Professional of over 14 years working in partnership with her community providing a fun approach to holistic health. The Rural Gardens of Grey and Bruce Counties, Canada's original private gardens network, 2 dozen widely diverse gardens await your visit. "Don't dig it on The Bruce" One of our latest campaigns is to encourage people to stop lifting our native plants. Please don't do it! Mother Nature put them there for everyone to enjoy. Juna Guetter and Sabine Hildebrandt, Intuitive Coaches are committed to helping you live your magical, true-to-you life in communion with your body and the earth. Their platform is called Synergy in Motion. Through their many talents, they have helped both Tom and I have to move through significant blocks in our lives and emerge to become more life ourselves every day. Harvest Hosts is a community of farmers, winemakers and RVers who have joined together to create an exciting alternative to campgrounds. This unique membership program is the first in North America to offer RV owners free overnight stops at wineries, farms and many other locations of interest. 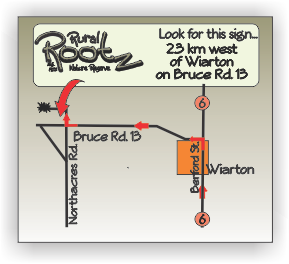 Beginning in the summer of 2012 Rural Rootz will be a Harvest Host. Slide show of tour of Rural Rootz Nature Reserve and Gardens - caution - large images.